Over 70 million Americans have an undiagnosed sleep disorder and should be tested. Currently there are a limited number of sleep laboratories operating in the US. In fact, if all of the existing sleep labs operated at 100% capacity every day of the year, they would only be able to test 6% of the available market during that time. We recently installed the EEG (electroencephalograph) segment of our proprietary OmniPro system in three client hospitals. The EEG data collection, processing, and reporting are very similar to our Sleep Disorders Testing service. Our clients are reporting tremendous satisfaction with the significant improvement in ease of use while continuing to rely on our standard same-day turnaround time for results. Some of the improvements include software that automatically uploads patient files for processing and report downloads when they are ready. And, of course, all of the HIPAA safeguards in place for our sleep program apply to EEG. The improvements we’ve made in our system exemplify our ongoing commitment to quality. “Mays & Associates always does what they say they are going to do. The quality of the reports is excellent and the turn-around times are great." 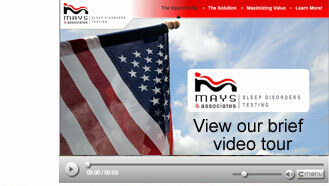 To find out more about how Mays & Associates can help you increase your profit margins, click here.